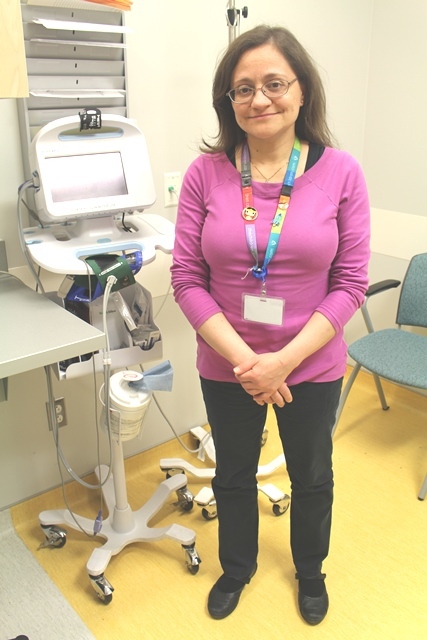 Clelia Coccia, who works primarily with patients who have chronic or degenerative neuromuscular disorders, considers a good day to be one where she can make her patients and families smile. To celebrate Nursing Week, we asked the 26-year veteran about her profession and what drives her. Q: How long have you been working at the Children’s? A: I’ve been working as a nurse at the Children’s for 26 years. The first 10 years, I worked on the medical units, and the last 16 years I have been working in the Complex Care Service (CCS) of the Pediatric Day Centre. Q: What attracted you to a career in nursing? A: I guess I always felt that no one should suffer due to illness. Everyday life can be challenging enough on its own. Once illness is thrown into the mix, people’s lives can be shattered. Q: What is your favourite part of your job? A: Helping our patients any which way I can. Most of the children I follow have illnesses that are not curable. However, if I can help treat their illness or slow down its progression that makes me happy. If I can reduce their stress and anxiety or even help put a smile on a child’s or parent’s face, then I consider that to be a good day. We refer many of the children we follow to the Make-a-Wish or Children’s Wish foundations which help grant their wishes. Seeing the children’s--and parents’--faces light up when they tell us all about the experience is one of my favourite parts of my job. A: Honestly, it’s the families that keep me going. It’s horrible that bad things happen to good people. Doing what I can to help these families keeps me in nursing. Also, my colleagues in the Pediatric Day Centre are very dedicated, supportive and we make a good team. This helps us all to carry on.